Party General Secretary Nguyen Phu Trong and Lao Party chief and President Bounnhang Volachith underscored the significance of traditional friendship and cooperation between the two countries during their talks in Hanoi on April 25, the first day of the latter’s three-day visit to Vietnam. 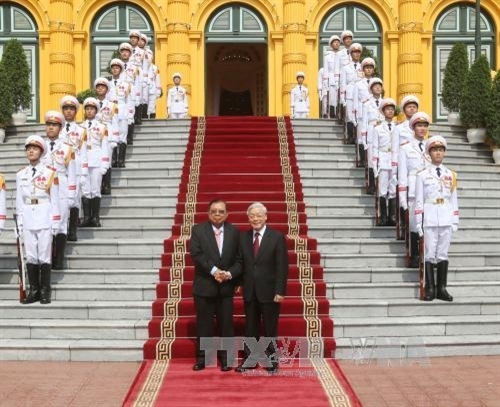 They affirmed that the two Parties and peoples would do their best to maintain and nurture the Vietnam-Laos ties, pledging to intensify the bilateral comprehensive partnership while giving priority to each other for the sake of each country’s prosperity, and for peace, stability, cooperation and development. The two leaders agreed to further improve the quality of ideological exchange and the realities of Party building work as well as state and socio-economic management while raising public awareness of the bilateral relationship and working closely together to celebrate the 55th anniversary of diplomatic ties and the 40th anniversary of the signing of the Treaty of Friendship and Cooperation next year. Both sides pledged a close collaboration in regional and global issues and at multilateral forums, contributing to a strong Association of Southeast Asian Nations. They also committed to sustainably and effectively using and managing Mekong River water resources, and effectively carrying out projects in the Laos-Vietnam-Cambodia development triangle.